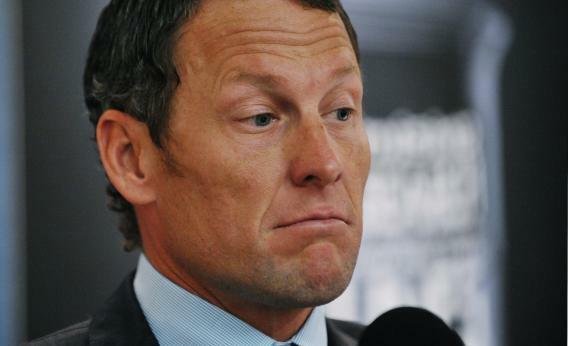 Lance Armstrong doping: How the cyclist is like Lehman Bros. The striking similarities between the culture of cycling and the culture of Wall Street. Daniel Coyle is the co-author, with Tyler Hamilton, of the new book The Secret Race: Inside the Hidden World of the Tour de France: Doping, Cover-ups, and Winning at All Costs. Listen to Coyle talk about Lance Armstrong and cycling’s culture of doping on Slate’s sports podcast, Hang Up and Listen. It keeps getting worse for Lance Armstrong. On Wednesday, a week after the U. S. Anti-Doping Agency released its devastating 1,000-page report on the cyclist’s doping, the seven-time Tour de France winner stepped down as the chairman of his cancer charity, Livestrong. Armstrong’s greatest commercial supporter, Nike, also announced it is severing ties with him. “Due to the seemingly insurmountable evidence that Lance Armstrong participated in doping and misled Nike for more than a decade, it is with great sadness that we have terminated our contract with him,” the company explained in a statement. The Armstrong story is a familiar one, and it leaves us in the frustrating position of asking why our top athletes keep choosing to dope, cover up, and end up disgraced. While it’s tempting to explain Armstrong’s fall through traditional notions of temptation and sin, it might be more useful to look to the world of finance and Wall Street. In both cases, a culture of excess and risk led to record-breaking performances, and then to catastrophe. In both cases, the behavior in question was driven by a distinct set of social forces, including a win-at-all-costs culture, lack of regulation, and the credulousness of journalists and the public. In many ways, the structure of professional cycling resembles a trading floor: small, tightly knit teams competing daily, with great intensity and effort, for marginal rewards. A single percentage point can make the difference between winning and losing. A few chose to go home. Those who stayed, like Hamilton, found themselves in a chemical arms race. Riders and doctors began pushing farther, augmenting EPO with insulin, human growth hormone, testosterone, artificial hemoglobin, and the medieval but highly effective method of banking and reinfusing one’s own blood. They did so largely without fear of being caught. During the Armstrong era, cyclists regarded drug testers with the same nod-and-wink aloofness with which Wall Street firms regarded the SEC. The joke among riders of the era was that drug tests weren’t actually drug tests—they were I.Q. tests, easily beaten through evasion and careful dosage, as well as the overarching fact that the medical sophistication of the testers lagged several years behind that of the athletes. Spurred on by their fear of being outmaneuvered, teams and riders sought ever-more aggressive methods. During the 2000 Tour de France, Hamilton reinfused one pint of his own blood. By 2004, his regimen called for three pints. Many of us instinctively presume that cheating creates a level playing field. In fact, it does precisely the reverse. Widespread cheating rewards the few who have the best information, the most money, and the highest risk tolerance. In this world, Armstrong and his team ruled: Armstrong spent more than $1 million maintaining his exclusive relationship with Dr. Michele Ferrari, regarded as the sport’s best doping doctor. Armstrong used his private jet to transport drugs, and he cultivated a friendly working relationship with the sport’s governing body that, according to the USADA report, may have helped him evade sanction for a suspicious drug test in 2001. Armstrong also had an entrepreneurial attitude toward risk, hiring his gardener to follow the 1999 Tour de France on a motorcycle and deliver EPO. While a few intrepid journalists were farsighted enough to cast doubt on the validity of Armstrong and Postal’s dominant performances, most were content to focus on the myth-like story they witnessed on the road each July. Only in 2010, when the federal government and USADA began their respective investigations, did the truth begin to emerge. Thanks to investigators and the riders who have stepped forward, cycling now faces its watershed moment: an opportunity to build a culture of meaningful regulation, accountability, and to ensure a clean sport for future generations. The Armstrong era happened because doping worked so powerfully and lucratively that no one—not riders, not cycling’s governing body, not the media—was willing to stop it. It was a time of hollow magic. It helped create kings and heroes that were too big to fail. Until, all at once, they weren’t.